Nestled in the south Texas scrub overlooking Texas Hill wine country lies Living Waters Ranch. This perfect getaway features guided Gemsbok hunts as well as non-hunting activities ensure the entire family has the time of their life. Our Lodge features over 10,000 square feet of luxury waiting to pamper you. The best kept secret of central Texas! The Lipan Springs lodge is a prestigious classic western style ranch with room for up to 10 hunting clients. Simple pleasures of communal dining in a relaxed atmosphere and private access into our two large, spring-fed lakes - with excellent fishing is just a prelude for what the adventure that awaits you. 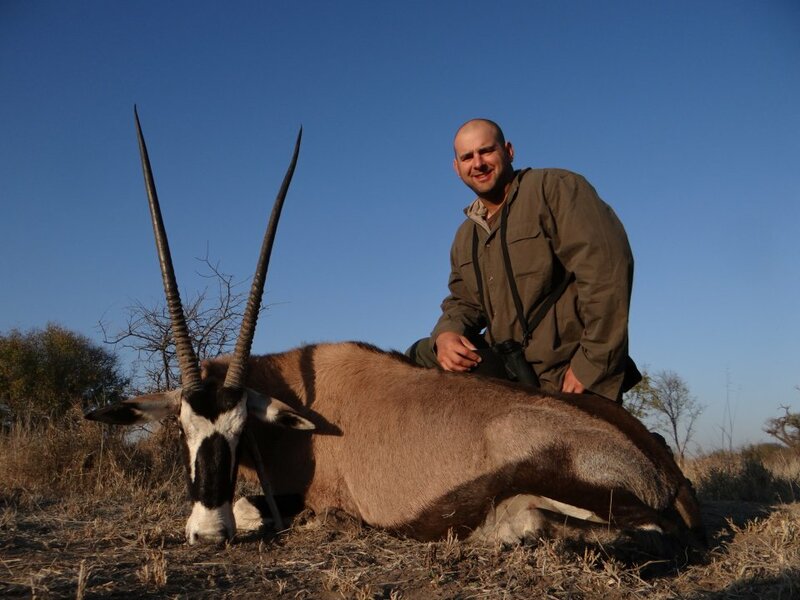 The high point is our low pressure trophy Gemsbok hunting reserve! At our 3rd generation Cenizo Ranch, we believe in lasting family connections with a ‘back to basics’ approach. Both native and exotic species roam the landscape surrounding our rustic 1,200 square foot Cenizo lodge, where you’ll enjoy southern Texas hospitality at its finest coupled with unprecedented Gemsbok trophy hunts. Experience for yourself and up to 8 people, this comfortable retreat at the end of your hunting day. An exotic species worthy of the state of Texas – there’s nothing diminutive about the Gemsbok you see on the ranches of LONE OAK ADVENTURES. The largest in the antelope family weighing in at over 600 lbs (and standing at an impressive 40”), Gemsbok hunting in Texas with us is truly an adventure. Don’t let the sheer size of this oryx fool you – these exotic herd animals are swift on their feet and can change directions quickly. This why having an experienced guide from LONE OAK ADVENTURES comes in handy. These large antelope are amazing to spot out in the field, and more impressive than their stature is their antler length – with their horns often measuring almost the entire animal height from hoof to withers! As if this wasn’t astonishing enough, the females tend to have longer – although narrower – antlers than the males. 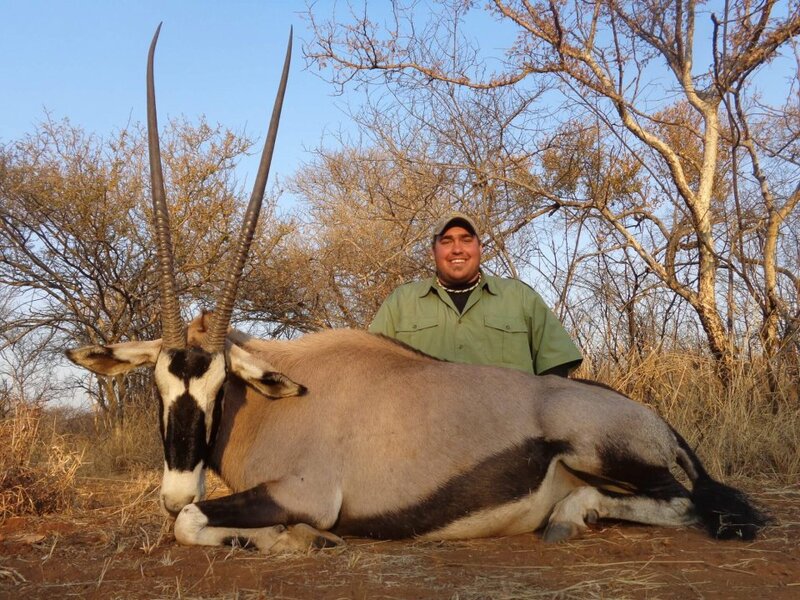 Don’t let an elusive trophy Gemsbok get away, make sure you’ve got an expert tracker with you who knows the best methods of hunting and finding these exotics. Luckily, our team at LONE OAK ADVENTURES has extensive experience hunting all types of exotics in Texas, as well as in their native African habitats. Gemsbok may reach up to snag leaves or fruit from trees – or dig down almost 3 feet to find roots and tubers! Like some of the other gazelle and oryx, the Gemsbok do not rely on drinking water for their hydration needs. With no true watering hole gathering spot mentality, Gemsbok are often spotted using a safari style approach, glassing from hilltops looking for their telltale antlers. 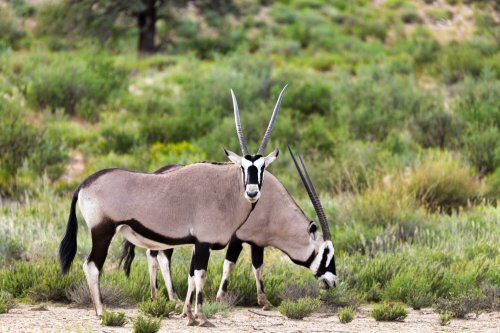 With access to watering holes and nutritional supplements, the Gemsbok on the ranches that LONE OAK ADVENTURES hunt survive for around 20 years. Perfectly suited for the Texas landscape, the Gemsbok prefer scrub and brushland. Unlike other antlered and horned creatures, the female Gemsbok grow longer than the males – who average 40” in length! The Gemsbok are social herd animals, who won’t back off from the challenge of a predator.